Beamit Communications is a single contact point solution for brand, strategy, design, creation, and delivery of optimal sales and marketing solutions. We focus on the end result - market share and revenue - to ensure all sales channels are equiped with the right tools. We have senior staff and experienced people who have been there and done that. Over our 20 years in Silicon Valley, we have formed alliances with the best & brightest contractors and vendors. We enlist and manage the appropriate talent for your projects based on budget and scope. With Beamit, you eliminate the big agency fees and only pay for the project deliverables. Using top level contractors, boutique agencies, and premier national alliances, we can scale to virtually any size project. 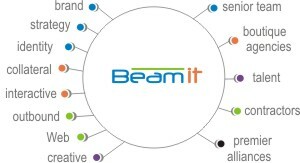 Once the project is over the team dissolves, but your investment in brand, strategy, design, and media is protected by Beamit for additional updates and new projects. You don't have to carry our overhead while we wait for new client revenue.